I mean impossible to follow -- I'm guessing that's why I get copies of the production notes and why you get to read reviews like this: to explain the plot. So here goes: Isabel (Nicole Kidman) is a woman in 1872 Europe who eschews the traditional life of the time (i.e. marry a rich guy) and has the world's first afro (check out the publicity stills). She's a rare free spirit in an age of repression. Turning down suitors played by Viggo Mortensen, Richard E. Grant, and Amateur's Martin Donovan, Isabel turns out to be pretty gullible, too, and gets suckered into marrying the manipulative Osmond (John Malkovich), thanks to the duplicity of Osmond's evil friend Madame Merle (a nearly unrecognizable Barbara Hershey). (Yes, it does sound very Dangerous Liaisons-ish.) Isabel soon finds her life pretty miserable, and then 124 years later they make a movie about it. That's way simplified. 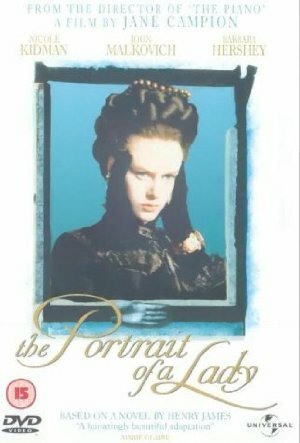 You're probably saying that Portrait is probably not the best movie material out there, and I agree, but if anyone was going to have the ability to pull this off, it was Campion, and I've got to give her credit for trying. Unfortunately, unlike The Piano, Portrait is incredibly hard to get at, a dense and mostly inaccessible try at making something into art. There's so much good about the film, though, that it's hard not to recommend -- the performances are top-notch, especially Donovan as Isabel's cousin, who really deserves notice for this production. Kidman is really coming into her own as a true talent, as well, and the remaining cast are all great. Again, beautiful art direction, cinematography, direction by Campion, and interesting editing all work to the film's advantage. The only problem I had: what's with the black & white inserts, slow-motion, askew angles, and singing beans(!?) that show up now and then? We do not need another Eraserhead. Oh well... you should still see it, if for no other reason than it will give you plenty of conversation material for a long time. And you'll get some interesting hairstyling ideas.